Entrance exams can be stressful experiences. Photo from News Net at Kobe University. 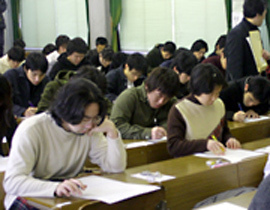 A period of intense pressure for Japanese high school and junior high school students, the entrance exam season is when students take intense and difficult examinations to continue on to the higher school of their choice. Many students will attend Juku, a series of private tutoring schools, in order to prepare for these examinations. Schools throughout the country will hold their examinations over a short period from late January through late February. A student applying to a private university must take an exam that is specific to that school. If the student is applying to a public university, he or she must take a standard national exam and a school specific exam. The need to prepare for multiple exams puts tremendous pressure on the student. Junior high school students will decide, with the help of their teacher, what school to apply for. If a junior high school student does not go to an academic high school, his or her chances for attending college will diminish. Students must decide at a very early stage their academic future.